Direct Response Copywriting: How Do I Get Freelancers To Sign Up And Participate In This Forum? 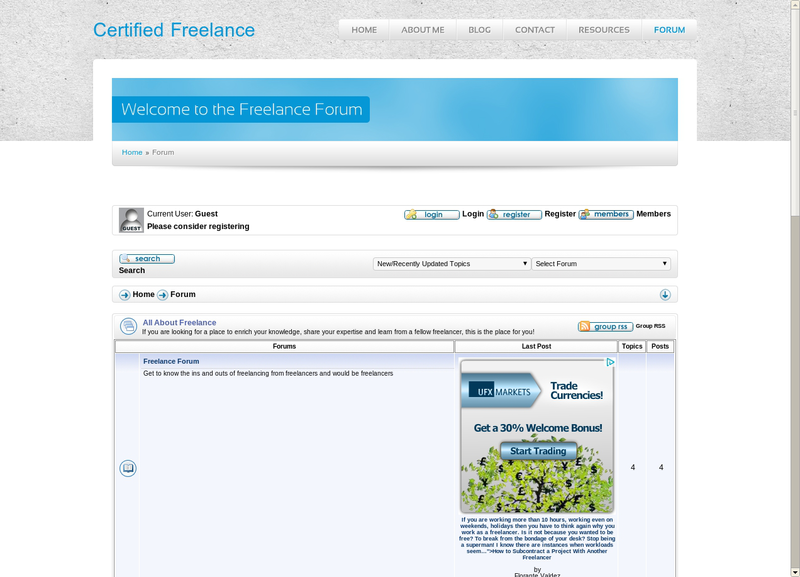 When someone first lands on your site, they see the headline "Certified Freelance" and "Welcome to the Freelance Forum." These words are weak for holding the reader's attention. It doesn't offer any benefit or advantage to them. Think about it. What is the primary benefit that you offer the reader when they find your forum? To connect from other freelancers? To learn about certain skills? To find help on how to improve their business? You need to be specific about this benefit and shout this out on your site's headline. When people find your website, they have a lot of other things on their mind. Your headline has to hold their attention, then encourage them to read whatever follows next. If I were a freelancer, I can name three other websites off the top off my head where I can find what I need. Your site has to motivate me to stay and not go to those other sites. Find something that will differentiate your forum from everyone else's. As I mentioned earlier, I can name three other freelancers' forum off the top of my head. Those are brands where your target audience will go without even thinking. What makes your site different from the leading brand? Does your forum cater to a specific country or location? Do you cater to writers only? What exciting things happen in your forum that they won't find someplace else? When you find that "One Thing" that makes your site different, put that in your headline. I assume you plan to include social sharing buttons on your site, so we won't go into that anymore. You can insert a code on the landing page to show the conversations that are going on in your forum. Show people which threads are the most active, or highlight open questions that the reader might have a solution for. Are you familiar with stackexchange.com? They have a reward system in that forum that encourages participation. You might want to have something like that as well. These recommendations are not final. We need to see how your audience will respond to these changes. It's going to be an ongoing process of testing and tweaking in the months to come. Start off with these, then get in touch with me with the results after 30 days.